Flowers are an essential part of most weddings. Whether flowers form the main theme or appear in a supporting role, they are a valuable addition to a wedding theme. These pretty little trinkets of nature have astounding beauty and versatility, and this factor makes them immensely appealing. The bouquet is a statement piece in every bride’s ensemble. However, few brides think beyond these floral beauties and include floral details to enhance color and visual interest at their weddings. Nonetheless, we just love weddings that include floral elements, where these natural details appear in interesting and unexpected places. Not only are they pretty to look at, they instantly add a cheerful and buoyant note to the scenery. Here are some ideas for inspiration. Take a look and we are sure you will want to embrace a few (if not all!) to add more floral fun to your wedding day. 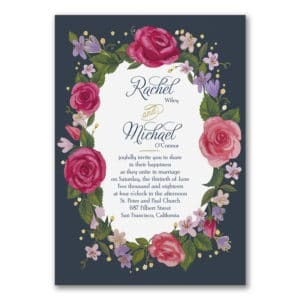 Invitations are a great way to let everyone know that you fancy flowers. Floral details on an invitation are always classic. Few colors can uplift spirits and create a dreamy invitation. And the options are endless. There are hundreds of flexible options that allow you to customize your invitation to the last detail. If you plan to DIY your wedding invites, florals are an amazing concept for innovative and impressive ideas. You can choose to go with watercolor images, photographs or even floral silhouettes to embellish wedding invitations. If you don’t want to do florals all the way and prefer subtle details, simply line the inside of your envelopes with floral prints. This detail will not go unnoticed, even while it will not compete with the main theme you choose. Take a look at this post on the Creative Market website for some brilliant ideas for DIY floral invitations. Choose a stunning flower-detailed dress for your little flower girl, and she will literally own her title! 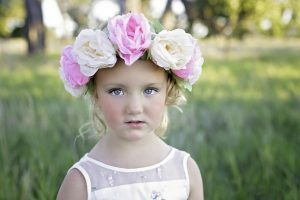 Little girls always love flowers, and we are sure your flower girl will be no different. There are several options to consider. You can choose a dress with flower prints that match the colors at your wedding. Another option is to choose a floral lace dress that is elegant and classic. Finally, you can go all out by choosing a dress embellished with 3-dimensional flowers like roses. You can always find dresses that match the colors of your wedding scene, with any of these options. 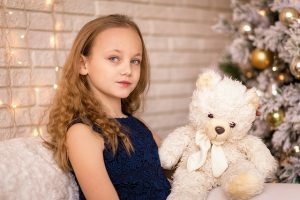 We are sure your flower girl will love your choice, no matter which of these three you finally decide upon. Let a floral crown be your hair accessory, and it will speak loudly of your love for flowers. Also, nothing else screams summer, like fresh and fragrant flowers on a bride. Delicate flower buds and dainty daisies can be woven together to form a splendid accessory for formal themes. If your wedding is outdoors or less formal in style, consider wearing an oversize flower crowns made from a rich selection of flowers to make a statement. If you do not desire such a dramatic look, there is always the option of weaving few flowers into your hair. Flowers can be used as natural embellishments for braided hairstyles. Fragrant flowers like jasmines and rose buds are beautiful and deliver a rich scent. You can also go for larger flowers like lilies or even local flora and fauna in your hairstyle to look the part. When choosing delicate flowers, remember that they are likely to wilt quickly. Either switch them out before they wear out or try to get hold of artificial flowers for the same effect. There are plenty of beautiful ideas on how to wear flowers in your hair in this post on the Bridal Guide. Check it out. Let your love for flowers free by choosing a wedding dress strewn with floral details. Floral lace is very popular among brides, with 3-dimensional motifs and appliques playing flower details to perfection. However, we suggest that you take it a step further. Choose a wedding dress with ample floral work to highlight your theme. Watercolor prints, colorful appliques or self-print fabrics can render a beautiful effect. Not only will you have a unique gown, it will be one that will forever remain etched in the memories of your onlookers. However, keep in mind that you may not easily come across bridal gowns with floral prints. With limited ready-made options, you may have to either go with what is available or custom-create your own dress. The other option is to shop in other dress aisles, like evening dresses or dresses for special occasions to find a suitable one. This beauty features cheerful pink roses on white fabric.A pretty pink sash compliments the beautiful roses. Although the dress features floral prints, it fits the wedding dress expectation with its voluminous skirt and statement style elements. Every bride needs an emergency kit for her wedding day. 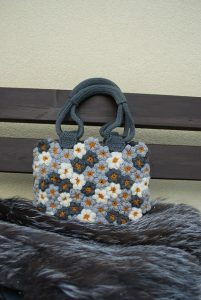 How about you pack all the essentials into a bag with flower-details? This will tie it to the theme, and will also be a beautiful addition to your ensemble. Choose a bag with floral details that match or compliment the texture of your wedding dress. You can also find one that goes well with the rest of your theme colors. Make sure the bag you choose has reasonable size, so it can comfortably house all that you need to carry. This would be things like your hair and makeup essentials, tissues, smelling salts, handkerchief. These items will help you touch up your hair and makeup to stay fresh during the course of the day. It should also have emergency supplies to tackle any unexpected accidents. For more details on what to pack into your emergency kit, take a look at this previous post. If you think a floral bridal gown is too much, dress your bridesmaids in floral prints instead. Florals being a popular summer theme, it will be rather easy to find bridesmaid dresses that fit the description. Either mix and match or choose the same dress to achieve the desired effect. However, remember that it is easy to get carried away when you choose printed dresses for your bridesmaids. So, have at least two constant dress elements that will keep the look cohesive. Simple silhouettes usually look the best, when you want the prints to be noticed. We also suggest keeping the rest of the accessories simple and monochromatic, so the emphasis is on the print on the dresses. Sugar flowers are always a pleasant sight, and hence the perfect choice for decorating wedding desserts. Whether used all over the wedding cake or scattered around the perimeter, floral cakes are always welcoming. Fresh edible flowers are another interesting option that add more visual interest to your dessert arrangement. Take a look at this previous post to find out how to decorate your wedding cake with flowers for a splendid effect. Finally, you can even consider cupcake cases adorned with flower details for the intended impact. These could be served at the table or set aside as favors for your guests to take home. Choose subtle and natural colors to create a refreshing and natural arrangement. Simple but uncluttered details look best on desserts that match a floral theme. 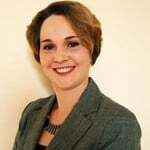 Take a look at the above image, for instance. 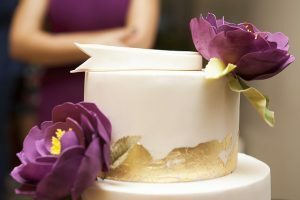 The flawless sculpted cake is embellished with just gold foil and purple blooms. Despite the simplicity of the details, it looks spectacular. 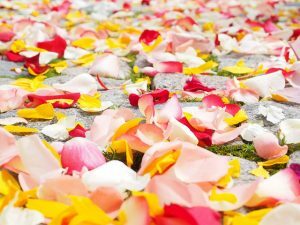 One of the timeless wedding traditions that continues to this day is to shower the newly weds with confetti.. Let petals replace paper confetti at your wedding. Pack them into delicate cones and hand it out to your guests to shower on you. 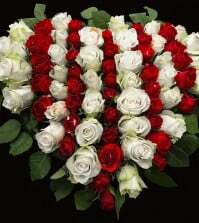 This is the most romantic option available, and it is easy to arrange. Freeze-dried petals are available for the purpose. These look fresh and being bio-degradable, are a green choice for the festivities. So, whether these are showered on you while you are outdoors or inside the wedding hall, you needn’t worry about cleaning up. Further, it doesn’t stain when in contact with your white wedding gown. You can also use the same to scatter on your wedding tables and even along the aisle for a colorful and interesting effect. Here is an interesting way to spice up your wedding tables with unexpected décor. 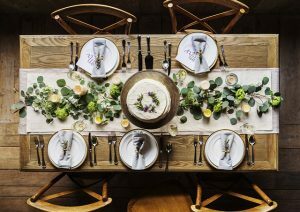 While your guests will be expecting to see flowers as part of the décor and in the centerpieces, they aren’t likely to expect the entire table runner to have flowers. Pack flowers throughout the runner of a long table, and the effect will be stunning. Use a neutral color tablecloth, so all the attention is focused on the colors of the flowers on it. Also keep the rest of the details simple, so there are no distractions and the flowers form the main focus of your tablescapes. Add colorful, fresh edible flowers as accents to signature cocktails that will be served at your wedding. This detail is rather simple, but will certainly not go unnoticed. Your guests will in fact appreciate your attention to detail. Make sure that the flower color compliments or contrasts with the color of the beverage that is served. 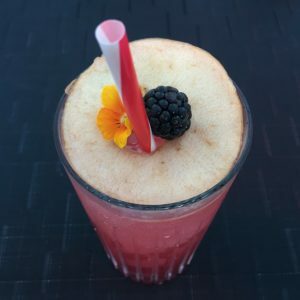 You can pair it with other elements in the garnish, such as berries to complete the effect. While choosing the garnish, ensure that the flowers are fresh. Keep the design simple, to just convey the theme without going overboard. Oversize blooms can also be placed in mason jars for a colorful touch. 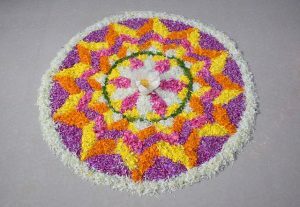 Arrange flowers or petals to form an attractive flower carpet that will steal everyone’s eye. Choose colors and designs that tie to the theme of your wedding, and set up the flower carpet at a location that will be easily visible. Although it can take a while to complete the details, the impact is worth it. Another benefit of this idea is that you can make the flower carpet as big or as small as you choose. It needn’t be formed of fresh flowers either. You can even add leftover petals from the rest of your décor or faux flowers to create an intricate design that is bound to impress. An unusual, but very impressive way to incorporate flowers into your wedding day scene is with a flower swing. It is also a wonderful photo prop, that can be the focus of many beautiful wedding photos. Find a well-lit, noticeable spot at your wedding venue and arrange to have a swing decorated with flower arrangements up. After the couple have their turn, it can be enjoyed by the rest of the guests and we are sure it will be a lot of fun for everyone. If it isn’t practical to have a hanging swing at your venue, we think this idea of the circular swing on the Hallmark channel website is the perfect alternative. We hope these ideas inspire you to add plenty of flower power to your big day. Do you have any more ideas, that we missed? If yes, we would love to hear them in the comments below. Weddings involve plenty of details, planning and work. Making your job easy is our aim at Best for Bride. As the one-stop bridal destination, we have all that you need to plan your big day. From perfect wedding gowns to wedding party attire and accessories, we bring you all you need for your wedding day. Check out our website here to find out all about what we have for all you beautiful brides out there. When it comes to the details that everyone is going to love, that is where I come into play. I am planning all the small things and he is taking care of the larger situations. Thanks for these tips! Great tips! I was just going to go with a fake flower display, but I really like your ideas and think they would fit better into my plan for the wedding. I really like the idea of petal confetti! That is easy to clean up, for the most part and can really add color to the event.